Have you ever thought about saving the world? Well, Gil Vicente thought of it, dreamt it, and painted the path to world salvation, only his was a violent and disturbing one. 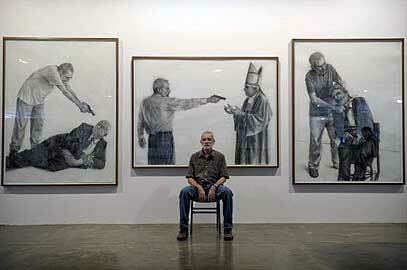 The Brazilian artist is currently presenting a series of drawings at the São Paulo Art Biennial, in which he portrays himself as an assassin, moments before he executes some of the world's most prominent leaders. Using a gun or knife, he is depicted "wasting" Brazilian President Lula da Silva, George W. Bush, Pope Benedict XVI, Mahmoud Ahmadinejad and also former Israeli Prime Minister Ariel Sharon. 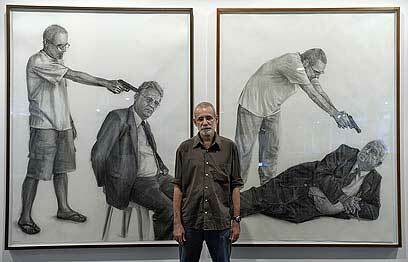 Vicente's exhibit features nine charcoal sketches, dedicated to the leaders, but not with love. The series is called "Enemies" and expresses the artist's wildest fantasies, which were not received well by the general public. Brazil's lawyers' association already filed an official request to remove the paintings from the Biennale, which opened Sunday morning. "Although art works are meant to express the spirit of the artist, there is a red line which should not be crossed," the appeal read. Vicente fiercely rejected the accusation. 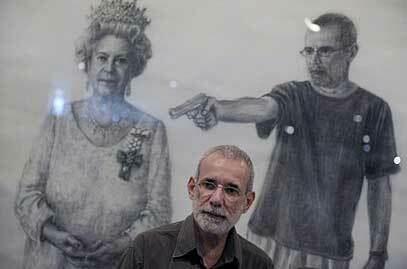 "They claim it's a crime," wondered the 52-year-old artist, "Is stealing money from the public not considered a crime? Are TV reports about violence not a crime? Do only my paintings empower crime? They want to remove my painting - not a chance. Why remove them? People have the right to view them," he said. 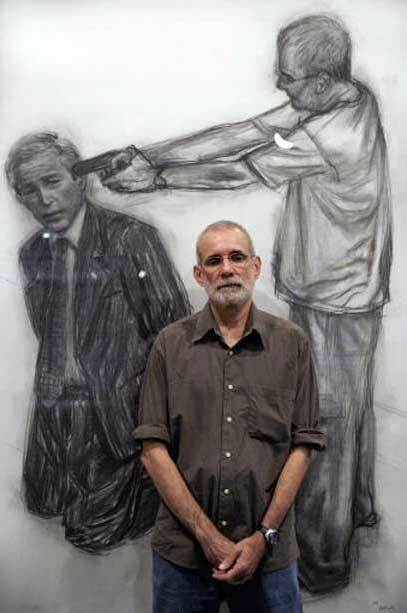 The artist began working on the enormous drawings - each canvas stretching to a height of 2 meters and width of 1.5 meters - back in 2005 when he depicted himself shooting George W. Bush in the head, while the former American president is kneeling on his knees with his hands handcuffed behind him. Other than Lula, who Vicente chose to kill by slitting his throat, all other leaders were assassinated in the same fashion - a single bullet. So is the case with Ariel Sharon, who is portrayed lying on the ground frightened. "The idea came to me following the disappointment so many people felt by the way our leaders were running the world," Vicente explained. "They killed so many people, so we better kill them too."